Guvar Phali Ki Sabzi-Cluster beans cooked with Yogurt and Indian spices- specialty from Rajasthan. 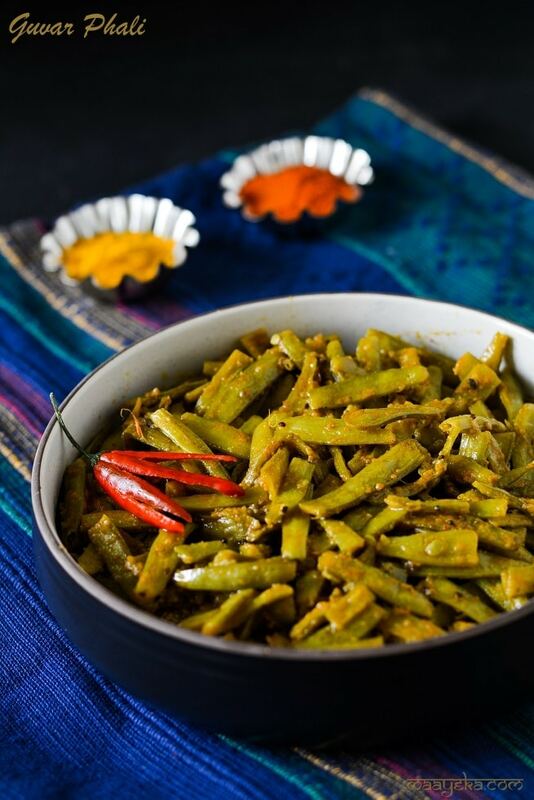 Guvar phali ki sabzi – cluster beans are slightly bitter in taste and takes little longer time to cook as compared to other beans. 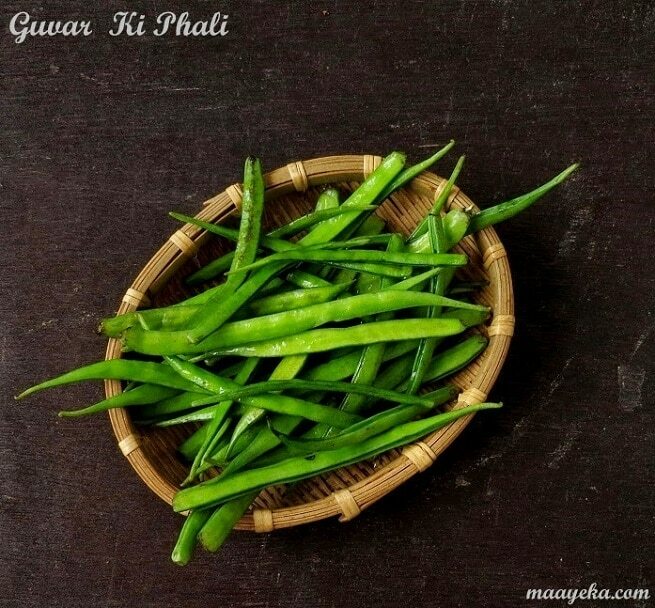 Guvar phali is very popular in the states of Rajasthan and Uttar pradesh . In Rajasthan they not only use the fresh guvar ki phali but also dry these bean pods and use them to make the popular – Ker sangri ki sabzi and also deep fry them to serve as a crispy . 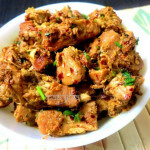 As guvar is slightly bitter in taste so a sour ingredients should be added in it ,either tamarind ,tomato,lemon juice or yogurt .You can make a dry preparation like this guvar sabzi or make it with slightly gravy with Guvar aloo ki sabzi or can make a delicious Gujarati style –Guvar dhokli ki sabzi. 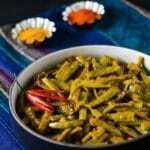 To make guvar ki sabzi you have to de-string the guvar beans from both the sides else it will ruin the taste but if the guvar beans are very tender and fresh then you can skip this step but hard ,big and ripe guvar need to de-string first. Wash and de-string the cluster beans/guvar and chop into medium size pieces. Open the cooker and drain the beans in a colander to drain off all the water,no need to press and squeeze the water from the beans. Now add green chili and saute for few seconds. Add turmeric, boiled guvar phali and salt and saute for a minute. Take curd in a bowl and mix sugar, chili powder, coriander powder and fennel powder and mix well. Add the yoghurt mix in the pan and mix with the guvar phali and let it cook on low heat for 2-3 minutes.keep stirring in between. When the gravy thickens then remove it from the heat. 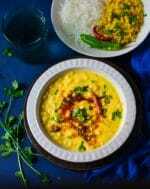 Serve hot with rice or any Indian bread of your choice. The pressure cooking time depends on the quality and thickness of guavar phali,tender small guvar get cooked faster and mature thick guvar takes time to cook so cook accordingly ,it may cook in 1-3 whistles. I have used Mustard oil but you can use any cooking oil of your choice. I made today this great vagitable called Cluster Beans but sorry to say mam it was only look delicious but there was not eatable, the taste was so bitter. Anyways thank you. 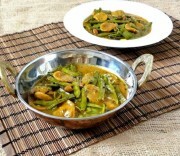 Hi Nikki – may be the problem was in your cluster beans ,some times vegetables like cluster bean ,turai ,lauki ,brinjals are bitter in taste and ruin the taste of the curry .My recipe is tried and tested many times and is always liked by every one, so do try it again ,hope you will like it surely. This is good and I loved it. I have just bought organic cluster beans from The Organic Garden and the taste of dish turned out to be amazingly well..
wow u have a awesome collection of recipes..n lovely clicks..i luv the aam achaar with chane,reminds me of my childhood ..happy to find u , m ur happy follower now.. This looks great! I love this vegetable. Made a note of the recipe. Love cluster beans so much, its my fav'…loved ur version, a must try recipe for me. Never tried making cluster beans this way..looks delicious. interesting way to cook gavar beans. I love this sabzi.. so sad that we don't get it in Brazil.. Your pic is amazing… so clear and nice…and ofcourse so is the sabzi. I think this is quite similar to what my mom makes by the look. I never asked her for her recipe. Giveaway # 1 – Cupcake Carrier – Bake n' Take! never tried with curd.. sounds new to me.. will try this way.. I usually make Poriyal(south indian style stir fry) with guvar beans, this stir fry sounds very interesting, i never tried with yogurt…will try yours next time!! i love the veggie….bt neva had try this way..thx for sharing!